Intended for skins with brown spots, it forms an occlusive film at the skin surface, enabling rapid and deep penetration of the active substances. Skin hyperpigmentation is reduced and the skin is lightened. The complexion is unified thanks to its exfoliating action. 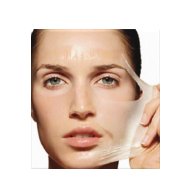 Apply a thin layer of Depiwhite peel off mask to the concerned areas. It can be manually removed in a single piece after being left to dry for 30 minutes. To ensure optimum results, repeat the operation 2 to 3 times per week for 2 to 6 months, then once per week as a maintenance treatment.